Clark Gillies was born and raised in Moose Jaw, Canada. In the summer he played baseball and in the winter hockey. Clark was so good at baseball that he played three seasons of minor-league baseball with the Houston Astros’ farm team in Covington, Virginia, where his season-high batting average was .256. Later on he once impressed the New York Mets as a power hitter when he took informal batting practice at Shea Stadium. But luckily enough for all hockey fans, Clark decided to pursue a hockey career instead. He played junior hockey for the Regina Pats (WHL) where he had three very solid seasons, collecting 79, 92 and 112 points. His last season culminated in a Memorial Cup win, the championship of junior hockey. What Clark developed in Regina was confidence. Clark also went on to be a massive 6-foot-3 and 215 pounds. His size, toughness and leadership qualities prompted the New York Islanders to draft him 4th overall in the 1974 entry draft. Clark immediately made an impact in the NHL by scoring 25 goals and 47 points. Although Clark got little support for Rookie of the Year honors in 1974-75, many hockey people still felt that he was a far superior player to Eric Vail, who won the Calder Memorial Trophy that season. As a rookie, Clark took on Dave Schultz in the Stanley Cup semifinals against the eventual champions Flyers. Schultz had just set a new NHL record with 472 PIMs and was the “terror of the NHL” at that time. Clark destroyed Schultz and sent everyone around the NHL a clear message: Nobody messes with Clark Gillies or the up and coming New York Islanders. Clark quickly blossomed into a key player in the Islanders’ quest for the Stanley Cup. He scored over 30 goals in six of his next seven seasons and had point totals of 61, 55, 85, 91, 54, 78 and 77. In the late 1970s and early 80s he was one of NHL’s premier left wingers and was a 1st team All-Star in 1978 and 79. He was also the MVP in the 1979 Challenge Cup series vs. the Soviets. And when Canada was trounced 8-1 against the Soviets in the 1981 Canada Cup final, Clark scored the only Canadian goal and was the only player on the Canadian squad who really gave 110% until the end. He didn’t dazzle you with his speed or his stickhandling. He had a hard shot, but his best trademarks were his great two-way play, hard work, leadership and the respect opponents had for his fists. Clark didn’t have to drop em’ very often, but when he did, there was virtually nobody who could beat him. Clark destroyed the reputation of quite a few so called enforcers. He once knocked out tough guy Ed Hospodar that left him in a pool of blood with a broken jaw…all this with one single punch! He also gave solid beatings to such great fighters as Terry O’Reilly and Al Secord. “I never thought about fighting or myself as an enforcer or a policeman. I was on the ice to do a job, score some goals and mainly stop the other guys from scoring. Fighting never was a priority to me.” Clark said. For many years Clark played on the so-called “Long Island Lighting Company” line. His original line mates on that line were Bryan Trottier and Billy Harris who was later replaced by Mike Bossy. The trio of Gillies-Trottier-Bossy couldn’t be stopped on most nights and struck fear into opponents. Clark always used his size and strength to his advantage while Bossy and Trottier conducted their magic with the puck. He was most effective when he positioned himself in front of the net to screen the goalie. Clark was also a great leader, and a proud member of the NHL captain’s fraternity. Clark was only 22 years old when he was selected to replace 36-year old veteran Ed Westfall as a captain on February 3, 1977. Westfall had been the Islanders’ only captain since 1972 at that time. “He’s just big and everybody likes him. Everybody looks up to him. His hustling gives us a lift out there. He hasn’t got a hated bone in his body. He’s easy to talk to, and he holds a lot of respect among the other fellas,” Trottier said. 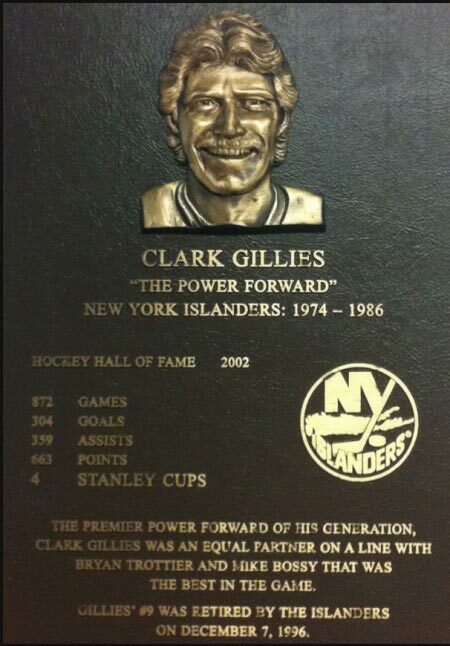 Clark played for the Islanders until 1986 and led them to four consecutive Stanley Cups. He was a vital part of the Islanders’ machinery and a great fan favorite. In 1986, the Islanders exposed Clark in the waiver draft. He was picked up by the Buffalo Sabres and played two more years for the Sabres before hanging ‘em up in 1988. He retired with 958 games under his belt, and 319 goals, 378 assists and 697 points in his pocket. More importantly, he has four Stanley Cup rings on his fingers, thanks in large part to his 94 points in 164 playoff games. Clark Gillies was the power forward of the 1970s and 80s. He did not only bang in goals from the slot, but he was great in the corners, a very good two-way player, could fight, worked hard, had fine leadership qualities, had a huge heart and was a winner. GMs today would kill to have a guy like Clark on their roster.